Sharyn McCrumb is the New York Times bestselling author of the acclaimed Ballad novels. She has received numerous honors for her work, including the Mary Frances Hobson Prize for Southern Literature, the AWA Book of the Year, and Notable Books in both The New York Times and LA Times. She was also named a Virginia Woman of History for Achievement in Literature. 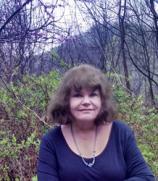 She lives and writes in Virginia’s Blue Ridge Mountains, fewer than 100 miles from where her family settled in 1790. The Greenbrier Ghost is renowned in American folklore, but Sharyn McCrumb is the first author to look beneath the legend to unearth the facts. Using a century of genealogical material and other historical documents, McCrumb reveals new information about the story and brings to life the personalities in the trial: the prosecutor, a former Confederate cavalryman; the defense attorney, a pro-Union bridgeburner, who nevertheless had owned slaves; and the mother of the murdered woman, who doggedly sticks to her ghost story --- all seen through the eyes of a young black lawyer on the cusp of a new century, with his own tragedies yet to come. Suddenly thrust into the role of primary caretaker for her family following the tragic death of her husband, Ellie Robbins is appointed to serve out his term as sheriff of their rural Tennessee mountain town. She has long proven she can handle herself. But becoming sheriff is altogether different, and the demands of the role are even more challenging when she is forced to combat society’s expectations for a woman. Soon enough, dark secrets come to light, and Ellie must grapple with small town superstitions and the tenuous ties she shares with a condemned killer as she carves out a place for herself in an uncertain future. John Sevier had not taken much interest in the American Revolution, since he was too busy fighting Indians in the Carolinas and taming the wilderness. But when an arrogant British officer threatened his settlement --- promising to burn the farms and kill families --- the war became personal. That arrogant officer is Patrick Ferguson of the British Army. Inventor of the Ferguson rifle and the devoted lover to his mistress, Virginia Sal, Patrick becomes a delightful anti-hero. What began as a fictional re-telling of the historical account of one of the most famous mountain ballads of all time became an astonishing revelation of the real culprit responsible for the murder of Laura Foster.